Do cats enjoy Saint Patrick’s Day and the history, legends, and folklore that go with it? Do they like the shamrocks, wearing of the green, dreaming of the leprechaun’s pot of gold at the end of the rainbow, or indulging in a, oh so little, sip of green beer? 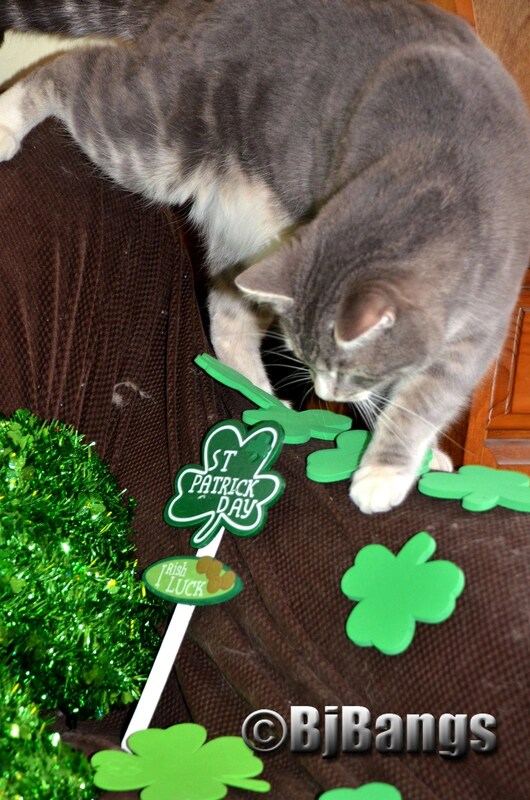 Cat Lenny checks out Saint Patrick’s Day Shamrocks. Or would they rather get caught up in the more pious celebrations of driving out the snakes and finding peace and tranquility within? Do they gather in front of the TV or in your apartment window and watch the thousands celebrate this festive day. Kitty Little Yellow basks in the glory of peace of the St. Patrick’s Day Shamrocks. Do they gather round the table as their humans dig into that oh so yummy smelling corned beef and cabbage? 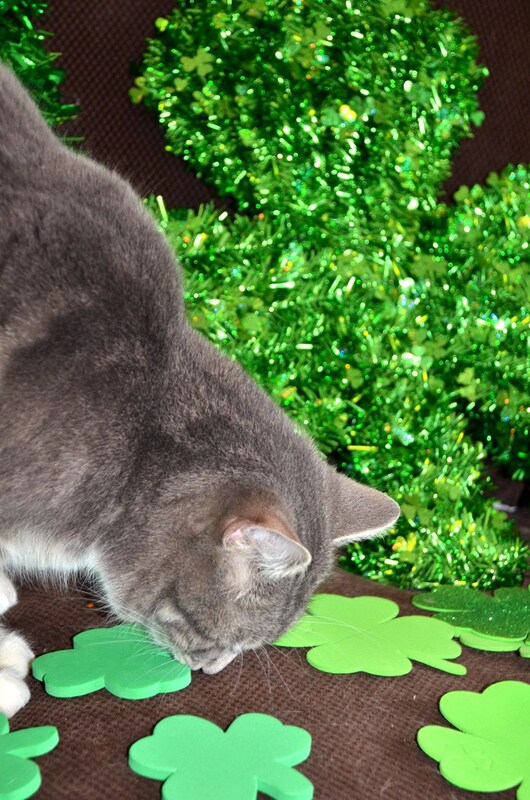 For Paws and our 5 felines, we did enjoy playing with the shamrocks. And the kitties are looking forward to some good ole human food, even if it’s just a taste. As for the green beer, they’ll take a whiff, and that’s probably enough for their feline taste buds. They, and humans around the world, from Boston to New York City, Chicago, Japan, Singapore, Russia and Dublin are celebrating the day in a more elaborate style. In Chicago, there is the famous dyeing the river green. In New York and Boston, the parades celebrate the cities’ long-standing Irish heritage. 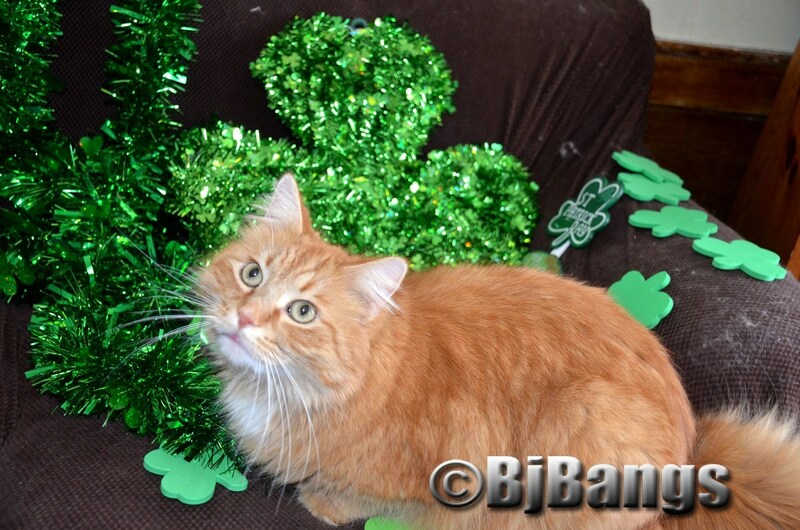 Cat Lenny wants to play with St. Patrick’s Day Shamrocks. 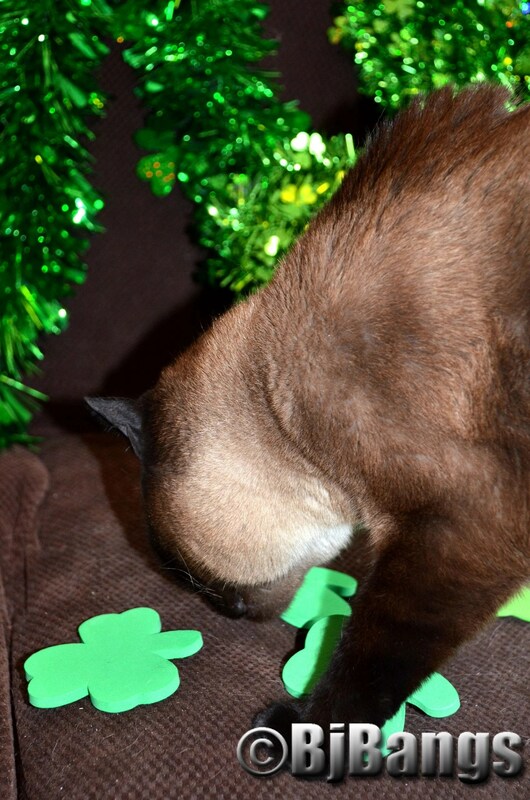 Siamese Cat Linus wonders if these St. Patrick’s Day Shamrocks might be as good as corned beef and cabbage. Over 35 million celebrate in just the United States alone. Paws became curious, where did Saint Patrick’s Day, and all these traditions come from. It’s a day of contradictions – from the merriment to the religious. Perhaps the paradox in that we are commemorating Saint Patrick and the arrival of Christianity in Ireland, while also celebrating Irish heritage. of eating and drinking, while taking a break from Lent, and all the things that are given up during that pious time. Paws was curious as to where it all came from. Here’s a little bit of what we found. Saint Patrick was not Irish, yet he became a patron saint from that country. He is credited with bringing Christianity to the Irish. We find the ‘Declaration’, supposedly written by Patrick, tells a few details of his life. He was born into a wealthy Roman-British family with strong religious roots. His father was a deacon and his grandfather was a priest in the Christian church. After he was kidnapped by Irish raiders and taken as a slave to Gaelic Ireland, he spent six years working as a shepherd. God told Patrick to flee to the coast, where a ship would be waiting to take him home. He went on to become a priest, and devoted his life to evangelizing in the northern half of Ireland. It is believed Saint Patrick died on March 17, 461. While legends about Saint Patrick’s life abound, one that is most notorious is that he explained the Holy Trinity (Father, Son and Holy Spirit) using the three leaves of a native Irish clover, the shamrock. Numbers played an important role in Celtic symbolism. Three, Ireland’s magic number, was the most sacred and magical number. It multiplies to nine, which is sacred to Brigit. Three may have signified totality: past, present and future; behind, before and here; or sky, earth and underworld. It is said everything good in Ireland comes in three’s. The other day, Paws ironically got an email message – Drive the Snakes Out – A Message from Saint Patrick. This left Paws curious, as this was one of the traditions, we could not find, when we blogged about Saint Patrick’s Day some 2 years ago. Saint Patrick’s Day is marked with celebrations of the great Irishsaint who awakened the dead and drove out the snakes from the Island Snakes and some say, all of Ireland, symbolizing getting rid of the inner demons and pagans, the snakes of anger, lust, and greed, to let the radiance of God shine forth through generosity, love and peace. Green has been associated with Ireland since at least the 1640s, when the green harp flag was used by the Irish Catholic Confederation. The phrase ‘the wearing of the green”‘ means wearing a shamrock on one’s clothing. Over the years, green has been associated with St. Patrick’s Day. As for the corned beef and cabbage connection, well, it appears that really doesn’t date back to Ireland. It’s an American tradition which dates back to Irish-American culture. It became popular in the U.S. after Irish immigrants in the northeast started substituting less expensive corned beef for pork and bacon. It would appear green beer also is an American tradition. Putting food coloring in beer is not something the Irish claim as a tradition. Saint Patrick’s Day was made an official Christian feast day in the early 17th century and is still observed by the Catholic Church, the Church of Ireland, the Eastern Orthodox Church, and Lutheran Church. It was originally considered as a way to break the strict Lenten traditions on eating and drinking for one day, giving rise to the tradition of partying and drinking green beer and Irish whiskey. The Irish have been observing the Roman Catholic feast day of St. Patrick on March 17 since the 9th or 10th century. However, the first parade held to honor St. Patrick’s Day took place in New York City, when in 1762, Irish soldiers serving in the English military marched through the Big Apple in 1762. It is said the parade helped the soldiers reconnect with their Irish roots. St. Patrick’s Day remained a religious occasion in Ireland until the 1970’s when laws were liberalized allowing pubs to be open. In 1995, the Irish government started capitalizing on the day as tourism took, and today Dublin’s St. Patrick’s Day celebration is a multi-day celebration with parades, concerts, outdoor theater productions and fireworks. The leprechaun is a fairytale. Steeped in Irish folklore, this funny looking old man dressed in green – usually no taller than a young boy – engages in lots of mischievous activities. The leprechauns spend their time busily making shoes, and store away all their coins in a hidden pot of gold at the end of the rainbow. If you catch a Leprechaun, they have to lead you to their treasure. But, be wary, if you take their eye off of them they will get away. If they are captured by a human, the Leprechaun has the magical power to grant three wishes, but that’s rare, as they are masters at getting away. Believe it or not, the Blarney Stone is a real place, and kissing the Blarney Stone is supposed to bring good luck and fortune. It is set in the wall of the Blarney Castle tower, which was built in 1446 with 18-foot walls, in the Irish village of Blarney. Kissing the stone is supposed to one a tremendous gift of gab, persuasive eloquence, otherwise, called blarney. The stone is located between the main castle wall and the parapet. Kissers have to stretch to their back and bend backward (and downward), holding iron bars for support. It’s always fun to figure out the history, legend and lore behind holidays. 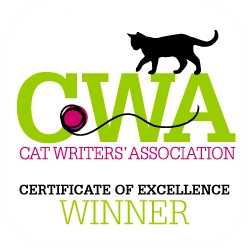 It combines a little history and a little fun, even though the cats really don’t care. However, the Irish felines might because it may mean a few more treats for them on this festive day. 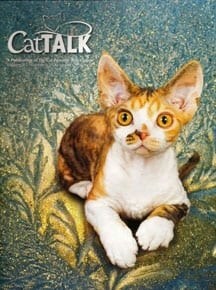 What are your kitties and their pet parents doing to celebrate St. Patrick’s Day? 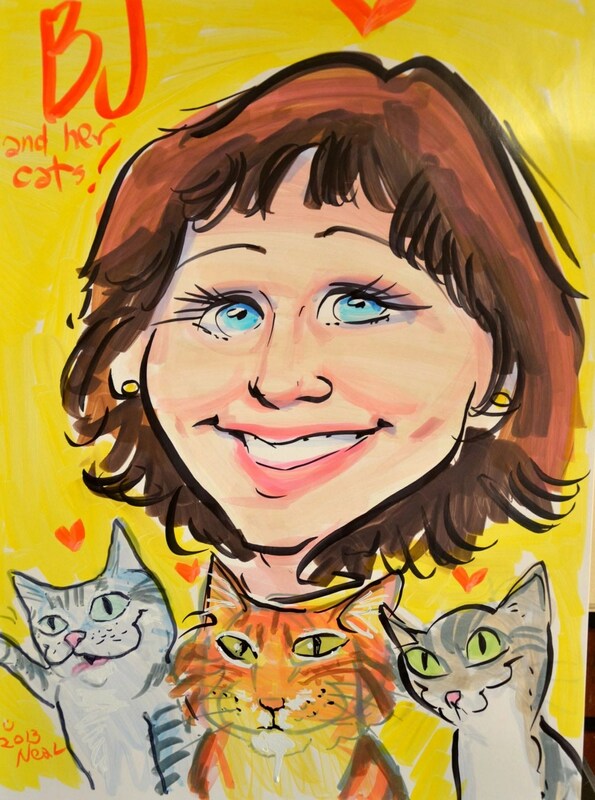 Do your felines like to dress up in green? And what do you think they would do if they had to make a wish to escape from the leprechaun? There’s no doubt, all of us would like to find that pot of gold, but what do you suppose the kitties would do with all that wealth. Please share your thoughts.